Palmer's is one of those brands that have been around for absolute years. One that I'm sure we've all tried in the past. Some people love it, others not so much. I tend to fall into the latter category because I'm really not big on the smell. Just recently they came out with a new coconut oil formula. The range consists of four products - a body lotion, a body oil, a body cream and a hand cream. 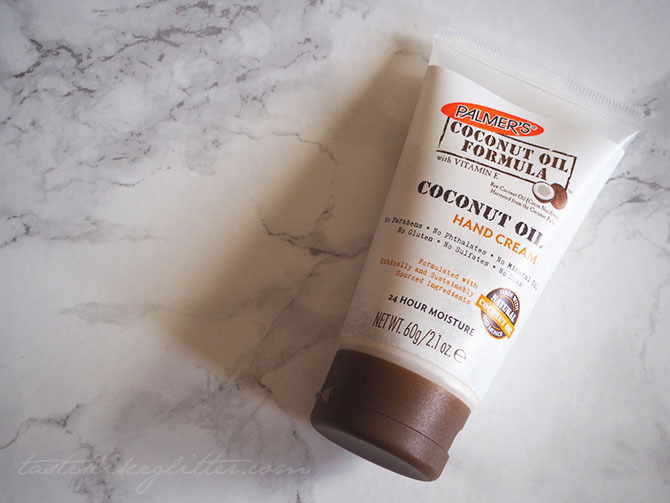 Being that I love all things coconut scented, I decided to pick up the hand cream and see how it performed. First thing I noticed when picking this up was the lack of nasties as listed on the front. No parabens, phthalates, mineral oil, gluten, sulfates or dyes. So what's in it? 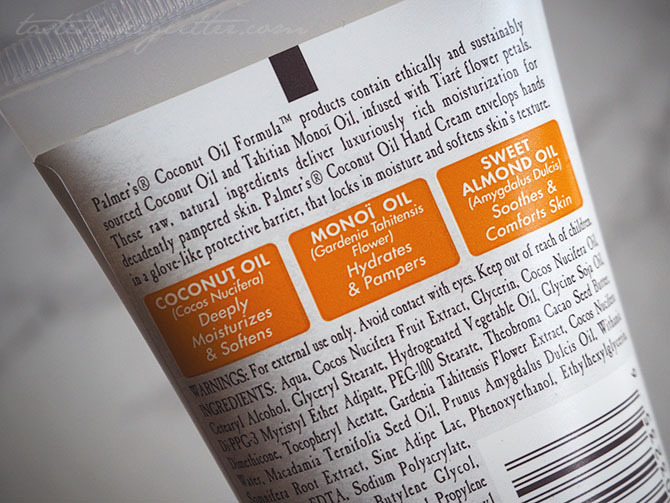 Coconut oil has been everywhere in the beauty industry for the last few years. The multipurpose oil can be used for cooking, shaving, deep conditioning hair and rubbing into stubborn dry skin, just to name a few of it's uses. So it's no surprise that it's one of the main ingredients in this. Along with it's moisturising properties it helps scent the product, giving it a wonderfully natural coconut scent. It also contains monoï oil which is something I've not heard of before but it's made from soaking the petals of Tahitian gardenias in coconut oil. When used on the skin it soothes and moisturises. Alongside almond oil which helps keep nails healthy and strong. From the first application I felt the difference after using it. It's quite thick in texture but easily sinks in without leaving behind a tacky layer on the skin. It leaves my skin feeling silky smooth without feeling like I've really applied anything. I can't stop applying this it just feels so lovely on the skin. I usually get lazy with applying hand cream as I hate when it leaves behind that tacky feeling. But this is something I've been applying daily since I picked it up.